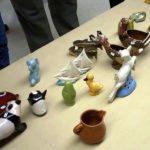 Linda and Bill Bakken visited the Wisconsin Pottery Association in March 2003 and gave a delightful presentation on Rosemeade Pottery. 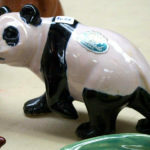 North Dakota’s Rosemeade Pottery, well-connected to the University of North Dakota’s ceramics department, was a relatively large company in its day, with as many as 27 employees . Rosemeade is said to have turned out 1,400 pieces a day at its peak. 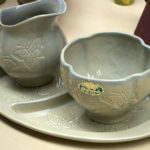 The company grew out of the Wahpeton Pottery Company, Wahpeton, N.D., under the direction of ND native Laura Taylor, who founded the pottery in 1940 with her husband-to-be, Robert J. Hughes. 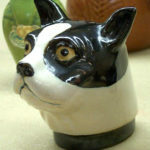 Laura Taylor was a student and assistant, in the late 1930s, at the University of North Dakota (UND) where famed ceramist (and Minnesota native) Margaret Cable taught from 1910–49. Taylor also studied with the well-known studio potter Glen Lukens at the State University Teachers College in Valley City, North Dakota, and was a supervisor for the Federal Clay project of the Works Progress Administration from 1936–39. She was chosen by the WPA to demonstrate throwing pottery at the New York World’s Fair in 1939. As Dr. Marion J. Nelson notes in his book “Art Pottery of the Midwest”, Taylor was apparently adept at throwing pottery, but Rosemeade’s only thrown pieces were small flower vases along with a few swirled pieces. A page from the National Geographic. The caption says “Laura Taylor Hughes Copies National Geographic Dogs in Rosemeade Pottery”. Note all the different figurines in the background. 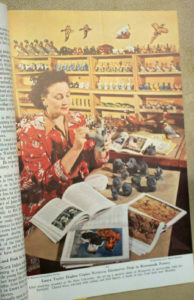 The Bakkens told of a 1951 article in National Geographic that featured North Dakota and included Laura Taylor Hughes, perhaps in part because she was known to use animal photos from that magazine as models for her pieces. Marion Nelson determined that Rosemeade had some qualities unusual to figurines, that earned it the label of American art pottery. 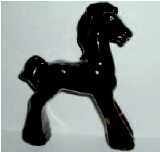 The colors of the pieces appear to have been applied with metal oxides under the glaze, a technique seldom found in figurines. The colors partially combined with the glaze and ran slightly during firing, creating a true ceramic effect. In addition, the buff color of the clay shows through, making the colors blend nicely. 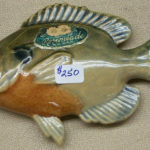 Rosemeade pottery is often identified by the Rosemeade sticker or label, although Linda and Bill report sometimes finding these stickers on non-Rosemeade pieces. As well, some pieces did not get labels. 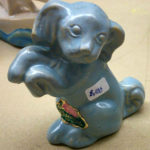 The pieces are also sometimes marked on the bottom, with stamps done in dark blue or black ink. There are a few embossed marks a well. 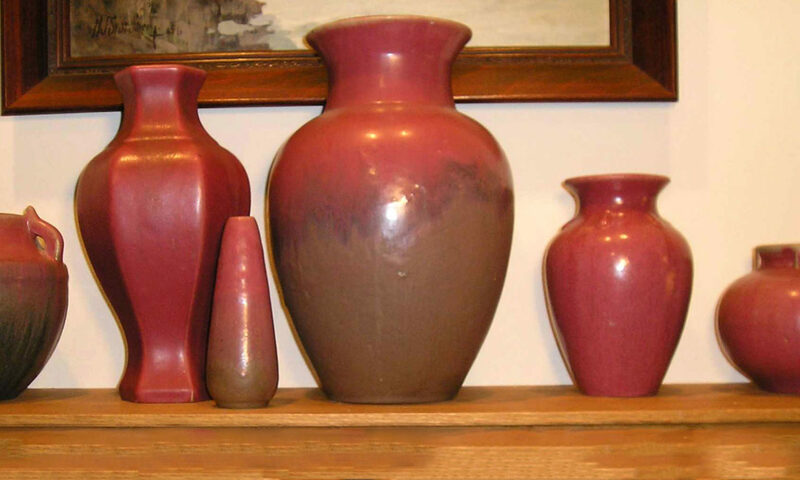 The clay for Rosemeade Pottery is often a sandy, beige color (N.D. clay) but some pieces are done in red clay too, “imported” from Kentucky. 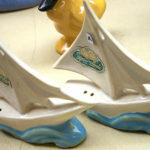 The swirl pieces have glaze on the inside, which is clear, blue or brown. A bottom stamp is the best way to identify these pieces. The “tail-up” pheasant is the most common, best-known piece. 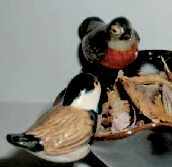 The Bakkens received this pheasant piece as a wedding gift, although Linda admits that it stayed in the cupboard for their first 15 years of wedded bliss, because they thought it was so tacky. Now, as devoted Rosemeade collectors, she suggests that perhaps the moral is that Rosemeade pottery grows on you. 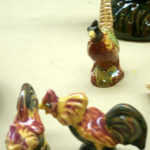 The animal figurines made by Rosemeade run the gamut: pheasants, horses, ducks, quail, chickens, bluebirds, robins, songbirds with perching stance. 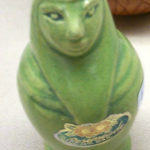 There were also fish figurines and cats done in unusual positions. The state flower of ND, the prairie rose, was used to decorate pin dishes, salt and peppers and spoon rests. Tulips decorate cream and sugars, salt and peppers, etc. Anne K, a friend of Laura T. Hughes, did some decorating—some of the pieces were marked Wahpeton, ND—she painted shoes and a few hearts, using a mark of “AK”. Rosemeade Pottery was sold throughout the U.S., although concentrated in the upper midwest. Laura Taylor Hughes died in 1959 and the Rosemeade plant closed in 1961. According to the Bakkens, prices of Rosemeade have decreased in the past four years, although prices have stabilized recently. Rosemeade collections available for viewing include: Wahpeton at the Richland County Museum and, soon to open, a collection at Bonanzaville, west of Fargo, ND. Two roosters with a pheasant in the background. 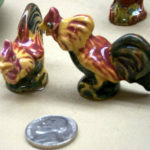 To give you a sense of the size of these roosters, notice the nickel in the foreground. 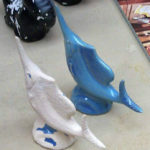 These two swordfish vividly show why you need to clean the salt out of shakers. The shaker to the left lost most of its glaze due to salt being kept in it. 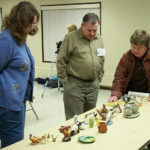 North Dakota Pottery Pottery Collectors Society has an article on Rosemeade and it is available here. North Dakota History: Journal of the Northern Plains has been published since 1926, and has published many articles on the pottery of North Dakota. Back issues are available and the articles are listed. Artist Fritz Scholder’s mother, Ella Mae Scholder worked for Rosemeade Pottery for several years according to North Dakota State Alumni Foundation. His father was Administrator of Indian Schools and for a time stayed at the Wahpeton Indian School. His Wisconsin connection was that he went to school in Ashland & Superior. A very interesting oral history is available at the Smithsonian Archive of American Art. As a child, he would paint envelopes and send them to famous people all over the world to sign with the postage from that country and have them sent back because he was a collector of stamps & postal covers. He recalled how he sent an envelope to Albert Einstein with his formula painted on it and he got it back signed and dated (due to the postmark).